The Time By Planetary Degrees tool will plot a vertical line every time a selected planet has travelled a set amount of degrees from a user-defined starting point. Multiple degree counts can be selected in the one tool, eg every time Mars moves 45- and 120-degrees from a major turning date (either from a GeoCentric or HelioCentric perspective). Once the Time By Planetary Degrees tool has been applied, adjust the planet and degree counts as required. Add New Level: Click this action to add an additional degree interval to the Time by Planetary Degrees count. 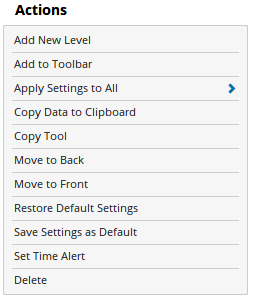 Add to Toolbar: Click this action to add the selected custom Time By Planetary Degrees to your custom toolbar. Apply Settings to All: When multiple Time By Planetary Degrees tools have been applied to a chart, page or workbook, this action can be used to apply the settings of the one selected to other instances of the tool. This is a great time saver if an adjustment is made to the tool – such as hiding or adding levels- as this allows all the other Time By Planetary Degrees tools in the chart, page or entire workbook to be updated instantly. 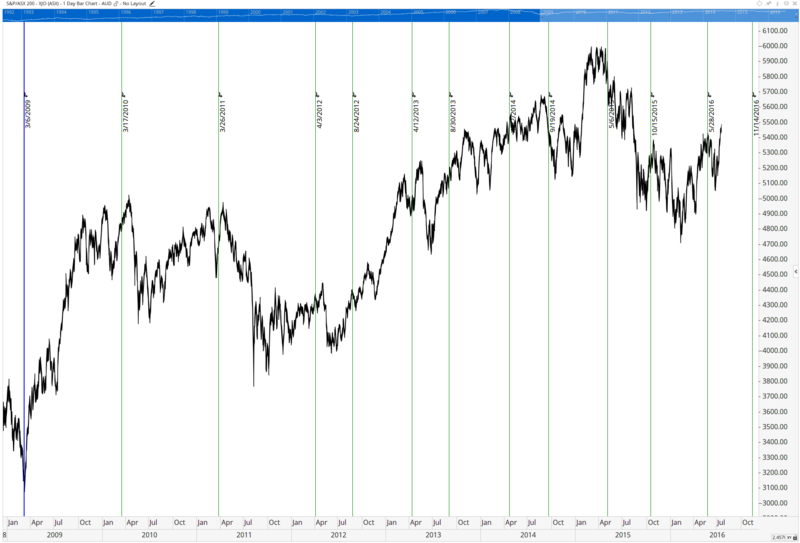 Copy Tool: Allows you to copy the selected Time By Planetary Degrees, which can then be pasted onto a different chart window. Restore Default Settings: Click this action if you have adjusted the default settings of the Time By Planetary Degrees, and wish to return to the standard properties originally installed with Optuma. Save Settings as Default: If you have adjusted any of the Time By Planetary Degrees Properties (colour, for example) you can save the adjustments as your new default setting. Each time you apply a new Time By Planetary Degrees to a chart, the tool will display using the new settings. Set Time Alert: Sets a time alert for the selected line. For more information on Time Alerts, click here. Delete: Delete the Time By Planetary Degrees tool from the chart. Degree Steps: Click on this option to display the different Time By Planetary Degrees levels. To add a new level to the chart, left-click on the blue + button and enter the values as needed. Visible – To hide a level, deselect the check box with the green tick. Name – Allows you to set a name for the degree level. Value – Sets the degree value. To change the value amount, click in the field and enter the new value. Line Style – Sets the line type, thickness, colour and transparency of the Time By Planetary Degrees lines. Planet: Select the planet and/or planetary body that is to be used in the Time By Planetary Degrees calculation. Start Date: Sets the starting date for the Time by Planetary Degree Intervals. Geo / Helio / Sidereal: This setting allows you to change the Time By Planetary Degrees setting between GeoCentric, HelioCentric, and Sidereal. GMT Offset: Use this option to adjust the Time By Planetary Degrees time zone setting for a specific market. Select the required GMT setting and the Time By Planetary Degrees will automatically update. Repeat Style: Select between repeating Every Step, All Exact Steps, or First Step. Direction: Selects which direction will be displayed, either Forward, Reverse or Both. Line Width: Allows you to adjust the width of the line for the Time By Planetary Degrees. Moving the slider bar to the right increases the thickness of the line. Line Colour: Allows you to adjust the colour of the Time By Planetary Degrees. Line Over All Views: Check this box to ensure that the Time By Planetary Degrees lines extend over all tools or indicators that are placed on the chart. For example, the lines will run through the volume indicator if this box is checked. Show Date: When selected the date for each Time By Planetary Degrees Interval will be displayed. Date Display: Allows you to choose between displaying Date Only, or Date and Time. Show Symbol: When selected the symbol for each Time By Planetary Degrees Interval will be displayed. Symbol Size: When Show Symbol is active, this property allows you to adjust the size of the Astro symbol. Moving the slider bar to the right increases the size of the symbol. Show Values: When selected the value for each Time By Planetary Degrees Interval will be displayed. 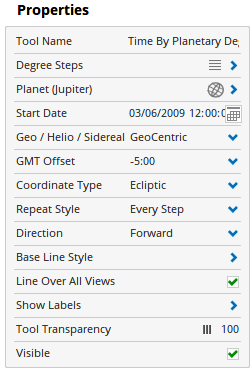 Label Size: Allows you to adjust the size of the Time By Planetary Degrees Intervals labels. Moving the slider bar to the right increases the thickness of the line. Label Colour: Allows you to adjust the colour of the Time By Planetary Degrees Intervals labels.